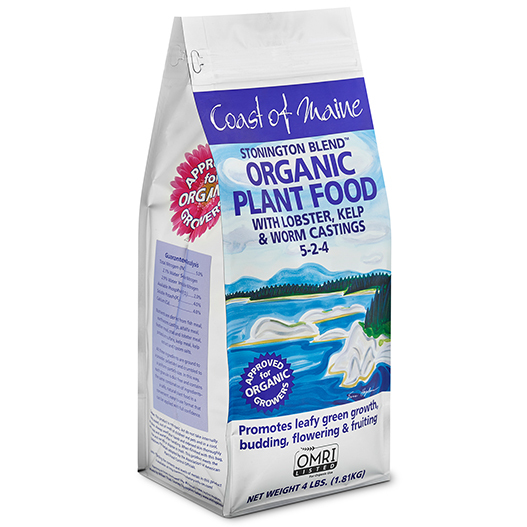 Coast of Maine Stonington Organic Plant Food (5 – 2 – 4) is an exceptional organic granular fertilizer made with lobster, crab, fish and kelp meal plus worm castings and other natural ingredients. It will help super charge the soil “biology” of containers as well as beds and gardens. It is also high in calcium which helps promote plant vigor. Available in 4lb bags. 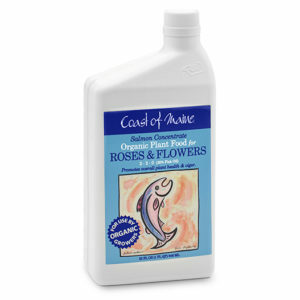 Fill the container with a premium potting soil or professional growing mix. 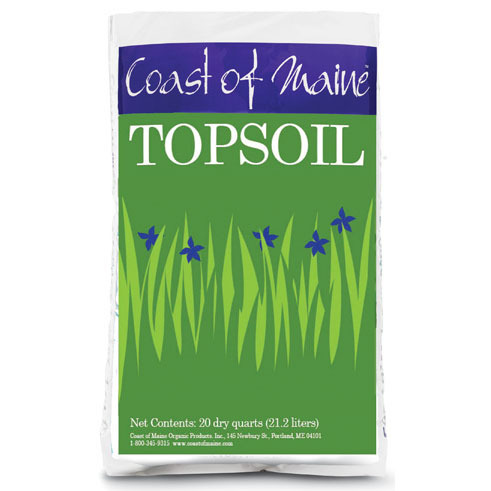 We recommend Coast of Maine’s Platinum Grower’s Mix for best results. 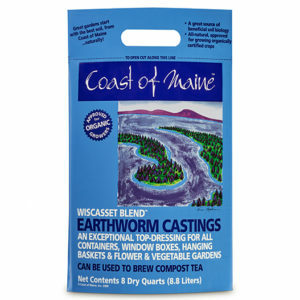 Then, incorporate 1 teaspoon per 6″ diameter of container or 1 tablespoon per square foot of soil. If you are maintaining an existing container, first water thoroughly, allowing the water to be absorbed prior to feeding. Then work the plant food and a little compost (if available), carefully into the soil around your plants. Mix 1lb. (3 cups) of plant food anper 1 cu. 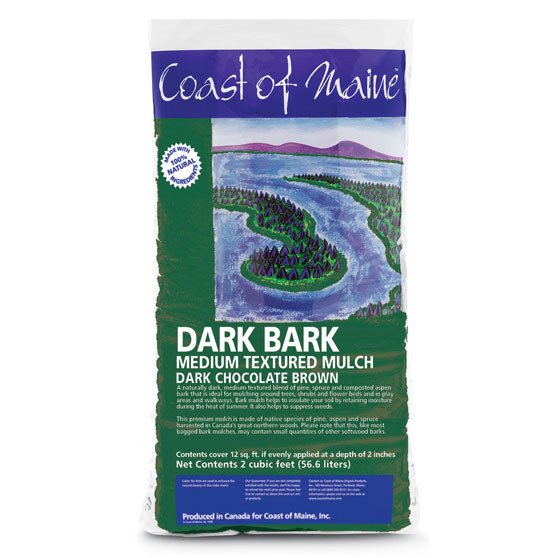 ft. bag of Coast of Maine Lobster Compost or any compost-based planting medium. Apply at a rate of 1 cu. ft. of compost per 5 square feet of garden in either the early spring or late fall. Work into the soil to a depth of 3 inches and water thoroughly. Combine 1lb. (or 3 cups) of plant food and 1 cu. ft. of Lobster Compost or other compost per 10 sq. ft. of garden as early in the season as possible after the last freeze. 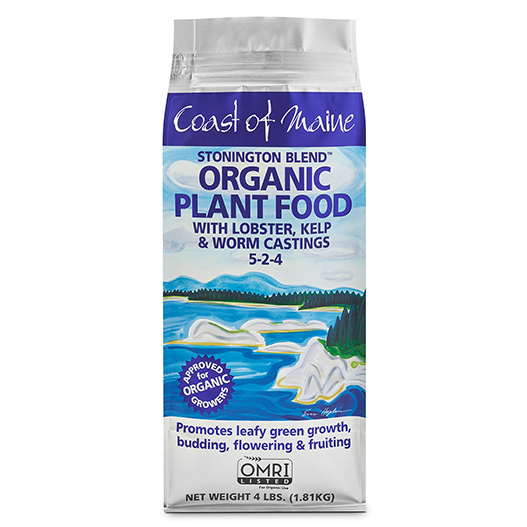 If your soil has already been amended with compost, just apply plant food at the same rate of 1lb. per 10 sq. ft. of garden, again as early in the season as possible. Apply again in mid-season if needed. Caution: This product is non-toxic, but do not take internally. Keep sealed, out of reach of children and pets and in a cool, dry place. Always wash your hands and exposed skin thoroughly with soap and water after handling. When finished with this bag, rince and recycle or dispose in trash. This product meets the guidelines for metals adopted by the Association of American Plant Food Control Officials. Info regarding the contents and levels of metals in this product is available at http://www.regulatory-info-cm.com/.